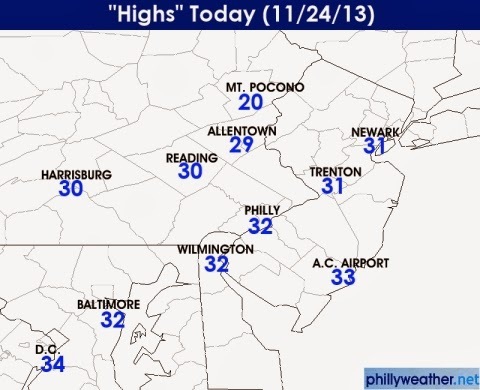 Philadelphia's high of 32 degrees is not only the coldest day we've had this autumn, not only the coldest high temperature on November 24th in Philadelphia's recorded history, but it's also the coldest November day since November 28th, 1996 when we only got to 30 degrees. Normal high for today is 53, which yields a 21 degree departure from average. Our 16 degree departure when you average in today's low and its departure from normal equals the largest negative departure to average this year (January 23rd). Today's cold will set up a potentially record tying or record setting night for temperatures in the city. Our record low tomorrow morning is 21 degrees and we are projecting that we tie that mark for a low overnight. The last time Philly was below freezing for a daytime high, regardless of time of year, was February 2nd, with a high of 30 on that date.